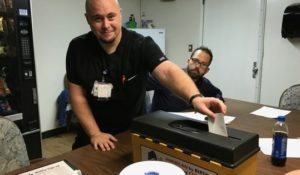 On Sept. 11, members of UFCW Local 152 who work at Eagleview Healthcare and Rehabilitation in Pittsgrove, New Jersey, ratified a new contract that includes wage increases and new benefits. The three-year contract, which was ratified by an overwhelming margin, introduces many new perks, including a wage increase for each year of the contract; shift differential rates for weekend, second, and third shift workers; and paid meal breaks if members need to work through their meal times for the needs of the business. Additionally, members will now have a lesser out-of-pocket cost for their health care benefits, including newly bargained legal services. UFCW Local 152 members at Eagleview Healthcare and Rehabilitation are employed as certified nursing assistants, dietary aides, housekeeping and laundry aides, and maintenance workers.